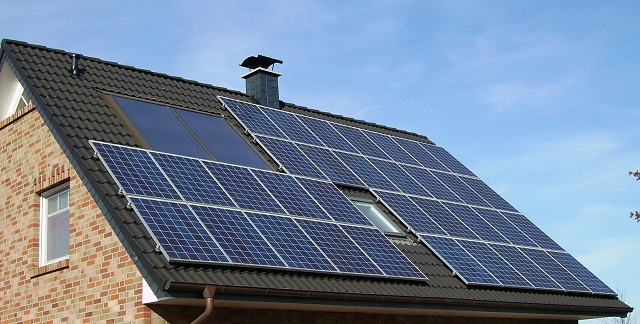 Solar panels on your home can save you money on household bills. But a build up of residue and grime may reduce their effectiveness. Cleaning solar panels is a delicate job, using the wrong brushes can result in damage. This can stop your solar panels from working properly. Our solar panel cleaning team are fully trained to clean your panels correctly. We use the most suitable materials to bring your solar panels back to like new condition, and generally from ground level using the latest in purified water pole technology. We clean solar panels from ground level up to 30ft without the need for expensive access equipment. No harsh chemicals – we only use soft head brushes with 100% purified water fed pole technology. CRB checked staff all fully uniformed. For most standard sized properties we can clean from ground level so there is no need to use costly scissor lifts, cherry pickers or scaffolding. Which helps us to keep the cost of cleaning down. We recommend getting your solar panels cleaned at least once a year. If you live in a home with trees near your property you may consider every 6 months, due to a heavier fall of leaves and twigs. To find out more or for your free residential solar panel cleaning quote please contact us or visit our FAQ page for further details.